The Detained Leader of the Indigenous People of Biafra (IPOB), Mazi Nnamdi Kanu, has disclosed his fear about the current Biafra agitation under his leadership to the family writers of IPOB during a visit to him at the KujePrison Abuja. According to him, “my fear has always been, will my people stand for me even at the point of death? Will they keep on fighting even when am not there anymore? Will they keep the commandment I gave them? Will the love of Biafra propel them to keep on the fight we all started together before my detention? 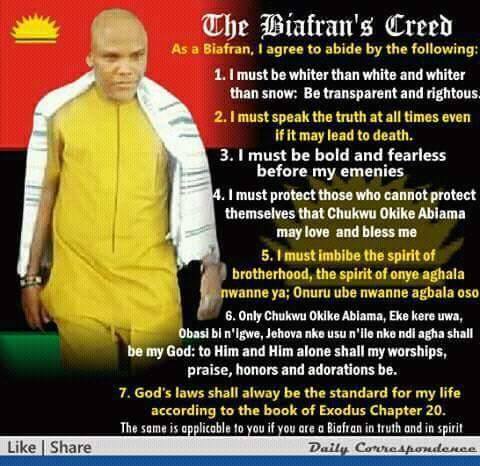 Will Biafra always be Paramount in their lives as I have always wished for? “Well little did I know I was training people that will see death as nothing when it comes to their freedom, little did I know that these people have always wanted to be free before I came. Little did I know they were prepared to give all to free Biafra. Their unconditional love for me and Biafra is beyond my making. 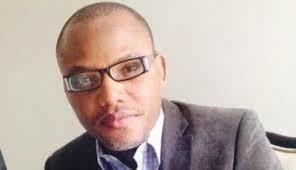 “My days of educating them on Radio Biafra was never in vain. My aim of trying to make them see Biafra as their only guarantee of a peaceful future has truly been achieved. “My people are been killed during various rallies and protest, yet they were not propelled into retreating or surrendering. Some are in prison and various detention centers yet the painful experience only makes them stronger and keep multiplying in their numbers. “They still maintain our “Biafra Or Death” creed. They don’t have any political sponsor, their liitle monthly contributions gives them the power to continue to fight and sink the zoo. My people may not be too great in number, but yet powerful and peaceful. “Because of their love for me and Biafra, I have promised never to let them down. I will never compromise this struggle even at the point of death. “My son ever since he was born have not seen me because of my love for Biafrans, I am here in prison in order that you may have Biafra. Am in detention because I want you to be emancipated from this demonic contraption called nigeria.